PHOTOGALLERY : Pinatubo Attemp #1 Failed, The True Adventure ! WHAT IS THE PINATUBO ITINERARY? GENERAL INFORMATION? WHAT TO BRING WHEN TREKKING PINATUBO? • Balicasag Island-Virgin Island Tour ( DAY 3 )-Estimated pick up at 5:00 AM, Drop at 12:00 PM. This is weather dependent. RESERVATION-INQUIRY FORM : MT PINATUBO PUBLIC TOUR-WEEEKEND-HOLIDAY ONLY-ARRIVING VIA OWN CAR OR FREE SHUTTLE AT DESIGNATED PICK UP POINTS-PHP 1950-2150-2250-2450-2750/PERSON :CLICK IMAGE TO SEE FULL DETAILS AND BOOK. 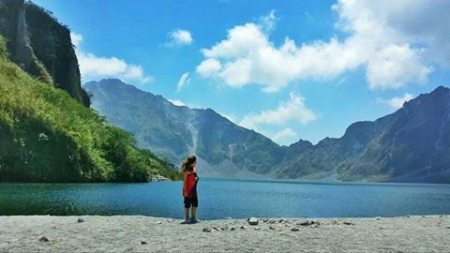 RESERVATION-INQUIRY FORM: MT PINATUBO PUBLIC TOUR-ANY DAY TOUR-AS LOW AS PHP 1525/PERSON-WITHOUT VAN TRANSFER-INITIAL DEPOSIT ONLY :CLICK IMAGE TO SEE FULL DETAILS AND BOOK. 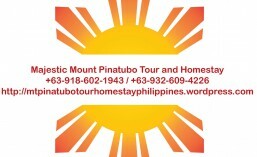 MT PINATUBO TOUR-PRIVATE -EXCLUSIVE USE OF VAN TRANSFER-WITH PICK UP/DROP-ANY DAY TOUR : CLICK IMAGE TO SEE FULL DETAILS AND BOOK. RESERVATION-REGISTRATION FORM :PINATUBO PUBLIC WEEKEND TOUR-PHP 1750-PHP 1950 PER PERSON-NO VAN TRANSFER-ALL IN-NO HIDDEN CHARGES : CLICK IMAGE TO SEE DETAILS AND BOOK. 60 years old above- bring ID and medical certificate or travel or health card insurance and Mandatory BP checking. PINATUBO VIA CAPAS ROUTE : Open even during rainy season. We operate daily. MOUNT PINATUBO TREKKING WILL REQUIRE A LOT OF ENERGY, STAMINA AND MUST BE PHYSICALLY FIT TO ENDURE THE TREK.DO NOT BOOK OR ENGAGE IN THIS ACTIVITY IF YOU ARE NOT PHYSICALLY FIT OR CANNOT SUSTAIN THE HIKE DUE TO HEART CONDITION,WITH ASTHMATIC EPISODES THAT CAN BE TRIGERRED BY DUST AND WITH DIFFICULTY IN WALKING.SWIMMING AT THE CRATER IS STRICTLY PROHIBITED AND BOATING AS WELL BY THE LOCAL TOURISM OFFICE.